Kahlo, who suffered from polio as a child, nearly died in a bus accident as a teenager. She suffered multiple fractures of her spine, collarbone and ribs, a shattered pelvis, broken foot and dislocated shoulder. She began to focus heavily on painting while recovering in a body cast. In her lifetime, she had 30 operations. Kahlo's first self-portrait was Self-Portrait in a Velvet Dress in 1926. It was painted in the style of 19th Century Mexican portrait painters who themselves were greatly influenced by the European Renaissance masters. She also sometimes drew from the Mexican painters in her use of a background of tied-back drapes. Self-Portrait - Time Flies (1929), Portrait of a a Woman in White (1930) and Self-Portrait Dedicated to Leon Trotsky (1937) all bear this background. In her second-self portrait, "Time Flies," Kahlo uses a folk style and vibrant colors. She wears peasant clothing, and the red, white and green in the painting are the colors of the Mexican flag. During her life, self portrait is a subject that Frida Kahlo always returns to, as artists have always returned to beloved themes - Vincent van Gogh his Sun Flowers, Paul Cezanne his Apples, and Claude Monet his Water Lilies. Kahlo and Rivera had a tumultuous relationship, marked by multiple affairs on both sides. Self-Portrait With Cropped Hair (1940), Kahlo is depicted in a man's suit, holding a pair of scissors, with her fallen hair around the chair in which she sits. This represents the times she would cut the hair Rivera loved when he had affairs. The 1937 painting Memory, the Heart, shows Kahlo's pain over her husband's affair with her younger sister Christina. A large broken heart at her feet shows the intensity of Kahlo's anguish. Frido and Diego divorced in 1939, but reunited a year later and remarried. The Two Fridas (1939) depicts Kahlo twice, shortly after the divorce. One Frida wears a costume from the Tehuana region of Mexico, representing the Frida that Diego loved. The other Frida wears a European dress as the woman who Diego betrayed and rejected. Later, she is back in Tehuana dress in Self-Portrait as a Tehuana (1943) and Self Portrait (1948). Pre-Columbian artifacts were common both in the Kahlo/Rivera home (Diego collected sculptures and idols, and Frido collected Jewelry) and in Kahlo's paintings. She wore jewelry from this period in "Self-Portrait -- Time Flies" (1926), Self-Portrait With Monkey (1938) and Self-Portrait With Braid (1941), among others. Other Pre-Columbian artifacts are found in The Four Inhabitants of Mexico City (1938), Girl With Death Mask (1938) and Self-Portrait With Small Monkeys (1945). I paint self-portraits because I am so often alone, because I am the person I know best." Frida Kahlo participated in the "International Exhibition of Surrealism" in 1940 at the Galeria de Arte, Mexicano. There, she exhibited her two largest paintings: The Two Fridas and The Wounded Table (1940). Surrealist Andrew Breton considered Kahlo a surrealistic, a label Kahlo rejected, saying she just painted her reality. However, In 1945, when Don Jose Domingo Lavin asked Frida Kahlo to read the book Moses and Monotheism by Sigmund Freud - whose psychoanalysis works Surrealism is based on - and paint her understanding and interpretation of this book. Frida Kahlo painted Moses, and this painting was recognized as second prize at the annual art exhibition in the Palacio de Bellas Artes. 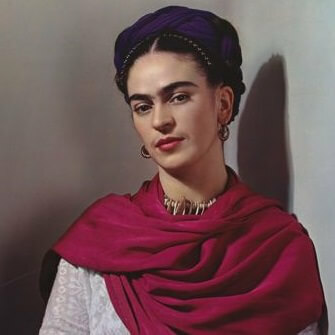 Kahlo did not sell many paintings in her lifetime, although she painted occasional portraits on commission. She had only one solo exhibition in Mexico in her lifetime, in 1953, just a year before her death at the age of 47. Today, her works sell for very high prices. In May 2006, Frida Kahlo self-portrait, Roots, was sold for $5.62 million at a Sotheby's auction in New York, sets a record as the most expensive Latin American work ever purchased at auction, and also makes Frida Kahlo one of the highest-selling woman in art. Widely known for her Marxist leanings, Frida, along with Marxism Revolutionary Che Guevara and a small band of contemporary figures, has become a countercultural symbol of 20th century, and created a legacy in paint that continue to inspire the imagination and mind. Born in 1907, dead at 47, Frida Kahlo achieved celebrity even in her brief lifetime that extended far beyond Mexico's borders, although nothing like the cult status that would eventually make her the mother of the selfie, her indelible image recognizable everywhere. At the Frida Kahlo Museum in Mexico City, her personal belongings are on display throughout the house, as if she still lived there. Kahlo was born and grew up in this building, whose cobalt walls gave way to the nickname of the Blue House. She lived there with her husband for some years, and she died there. 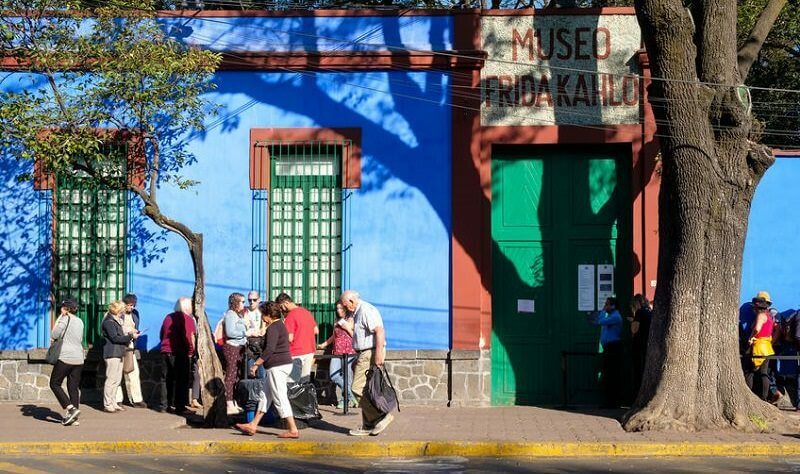 The facility is the most popular museum in the Coyoacan neighborhood and among the most visited in Mexico City.